John Piscacek, the Pasadena ISD's Associate Superintendent for Business and Finance, and Nina Conway, Director of Budget, accept an award for financial transparency at the August Board of Trustees meeting. 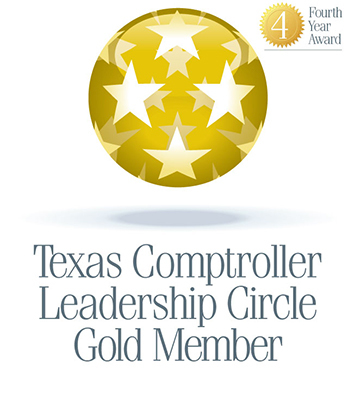 For the fourth year in a row, the Pasadena ISD has been awarded the Gold Leadership Circle Award for budget transparency by the Texas State Comptroller's office. The district's finance department and key stakeholders were recognized at the August Board of Trustees meeting where they accepted the award. Pasadena ISD received a gold star, scoring 18 out of the 20 possible points for ease of access to the annual budget, check registers and current tax rates. The Gold Leadership Circle program recognizes local governments and school districts across the state that meet a high standard of online financial transparency. "As a district, we want to be open and honest with our taxpayers," said John Piscacek, the district's associate superintendent for business and finance. "That is why all of our information and audits can be found from our homepage. We want to give the public a good idea of what we are doing with our money."